The Eastman Dental Dispensary, built in 1917 by George Eastman of the Eastman Kodak Company and Rochester’s leading philanthropist, contributed significantly to the improvement of dental hygiene in America and Europe, and was also the first school in the United States licensed to train dental hygienists, thus creating a new profession for women. The dispensary promoted preventive and reparative treatments, educated dentists, and developed dental equipment and materials, all at a time when dental care was largely nonexistent throughout the world. The design and programs of this Italian Renaissance style landmark inspired similar buildings in Stockholm, London, Rome, and Brussels (also built with donations from George Eastman). Four of the five still function as originally intended. Listed in the State and National Registers of Historic Places, and individually designated as a City of Rochester landmark, the Eastman Dental Dispensary is prominently located on a major gateway into downtown and features a distinctive design patterned on Italian Renaissance palazzos, with a symmetrical U-shape plan around a central court. The three-story west wing was added in 1964. The exceptional building materials include brick, bronze detailing, art tile mosaics, and Venetian marble trim. The dispensary was designed by Gordon, Madden and Kaelber, Rochester’s largest architectural firm in the 1920s and responsible for many of the city’s leading buildings including the Eastman Theatre and School of Music, Rochester Gas and Electric headquarters, the Rundel Memorial Library, and the Reynolds Arcade. 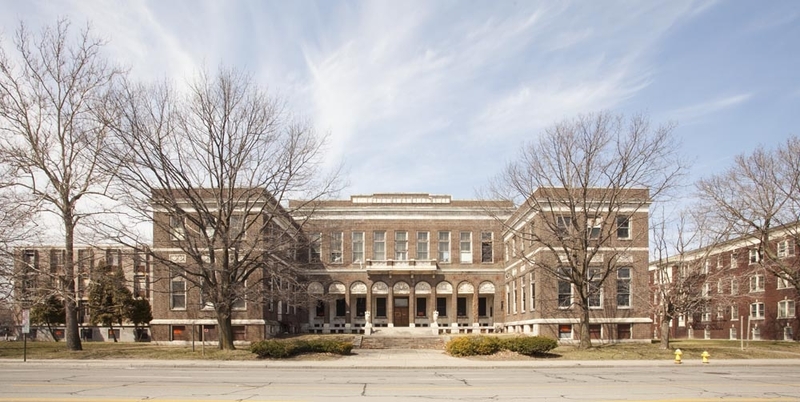 The dental dispensary was vacated in 1978 when a new dental school was constructed at the University of Rochester medical campus and no tenants have been in the building since 1984. A highly visible anchor on a major gateway into Rochester’s downtown and situated in a neighborhood with several other major examples of civic architecture, the Eastman Dental Dispensary presents an important opportunity to rehabilitate an exceptionally significant property that is unique in the city.